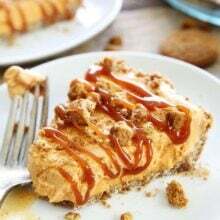 5-Ingredient Pumpkin Ice Cream Pie-pumpkin ice cream pie with a simple gingersnap cookie crust and a drizzle of salted caramel sauce. 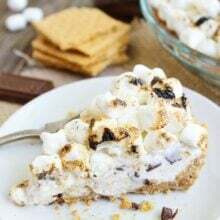 This easy pie is the perfect Thanksgiving dessert! I pretty much love everything pumpkin, except the traditional pumpkin pie. It is a texture thing! 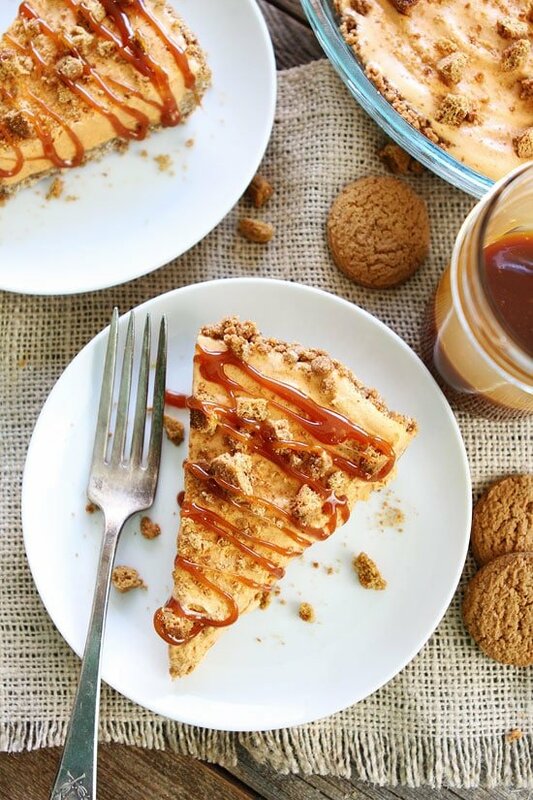 I do love this 5-Ingredient Pumpkin Ice Cream Pie. The ice cream is a game changer! This pie is the perfect dessert for Thanksgiving because it is beyond easy. You only need five ingredients: gingersnap cookies, sugar, butter, pumpkin ice cream, and salted caramel sauce. The gingersnap cookie crust is no fail. You don’t have to stress about pie crust, the cookie crust comes out perfect every single time! Another bonus, you can make the pie in advance. It will keep for a week in the freezer. So you can make it today and have your Thanksgiving dessert out of the way! 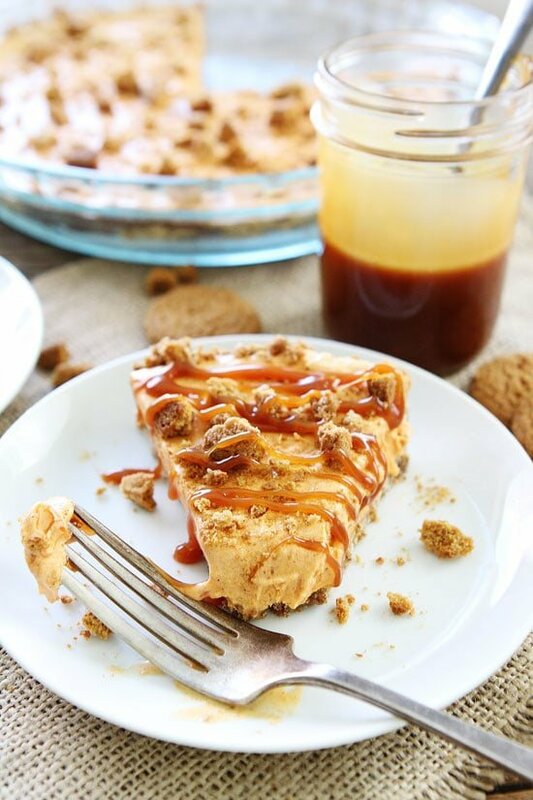 When you are ready to serve the pie, take it out of the freezer, cut it into slices and drizzle with salted caramel sauce! This easy 5-Ingredient Pumpkin Ice Cream Pie is a family favorite and I can’t wait to enjoy a piece on Thanksgiving. 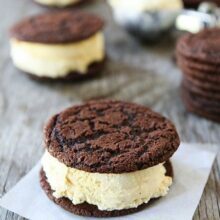 It is already in our freezer and I really, really want a piece right now, but I am waiting! The struggle is real! 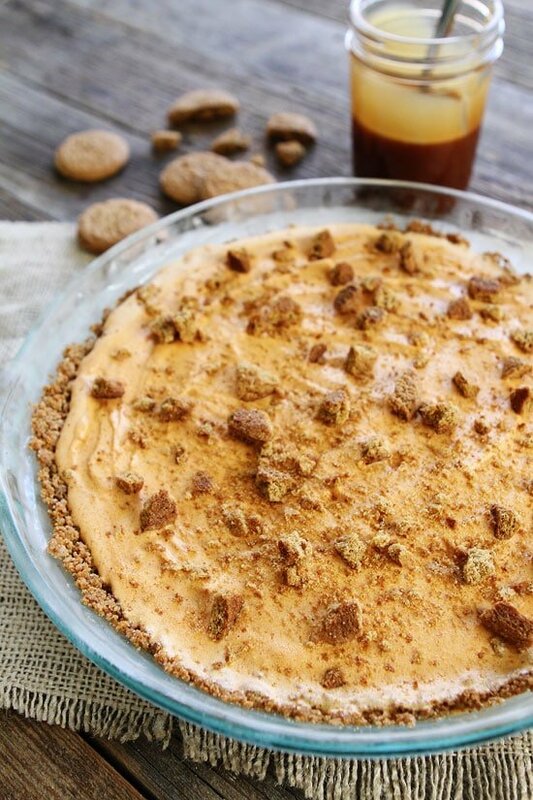 We hope you enjoy our family’s favorite 5-Ingredient Pumpkin Ice Cream Pie! It’s a winner! 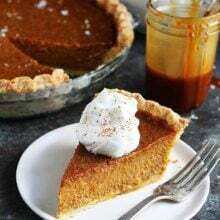 You only need 5 ingredients to make this pumpkin pie! It the perfect fall pie! Preheat oven to 350 degrees F. In a medium bowl, combine gingersnap cookie crumbs and sugar. Add melted butter and stir until mixture is evenly moistened. Transfer crumb mixture to 9-inch-diameter glass pie dish; press crumbs firmly and evenly onto bottom and up sides to top of dish. Bake for 10 minutes or until crust is firm. Cool crust completely. Carefully spoon softened ice cream into the cooled crust. Spread with a spatula until ice cream is even. Garnish with gingersnap cookie crumbles. Cover with plastic wrap and freeze for 2 hours or until firm. When ready to serve, remove the pie from the freezer. Cut into slices and drizzle with salted caramel sauce. Note-to make the gingersnap cookie crumbs, you can use a food processor or put the cookies in a large Ziploc bag and pound the cookies with a rolling pin until crushed. The pie will keep in the freezer for a week. Disclosure-this post is in partnership with The TODAY Show, but our opinions are our own. Thank you for supporting the brands that continue to make Two Peas and Their Pod possible. This pie looks MOUTHWATERING!! 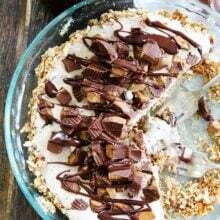 I love love love the gingersnap cookie crust idea! And don’t even get me started on how simple this is to make for anyone! It’s FABULOUS!! Yummy!! I would love a slice now! I am so glad you shared this recipe today. I was not looking forward to making the traditional pumpkin pie and now I don’t have to! Also, thank you for letting us know about the new TODAY Food Club. I can’t wait to sign up! Beautiful festive pie!! Love this!! 5 ingredients? SOLD! This looks amazing! This is soooooo tempting Maria!! 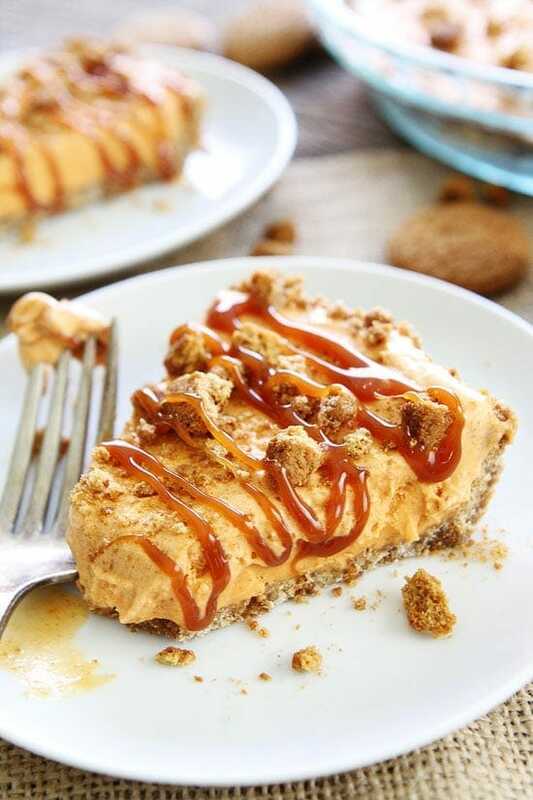 I love this twist on a traditional pumpkin pie – pumpkin ice cream pie – yes! AMAZING! I am making something similar for our Thanksgiving and now I am extra excited about it! We always eat pie for breakfast on the day after Thanksgiving. Thanks for the link for the TODAY food club, sounds like fun. Happy Thanksgiving! Pie for breakfast is a must! Happy Thanksgiving! Please, sign me up for this crazy deliciousness. Now this is my kind of Thanksgiving dessert! Heading over to check out the Today Food Club too, I’ve been hearing about it. Happy Thanksgiving! The caramel drizzle!!! Yes to this! 5 ingredients?? Count me in!! Ive never seen this before! Looks so yummy! We don’t celebrate Thanksgiving day in our country but still eat pumpkins. My mom really like pumpkins, so I think I will make her Pumpkin ice cream pie after reading this recipe. Thanks Maria and Josh for sharing the great recipe for family. too, It looks great and is easy to follow. Thanks for sharing this again! When I click on the Parm Spinach Pasta, this is where it takes me. I made this for Thanksgiving but the crust stuck like crazy! What did I do wrong? Really? Weird, I have never had that happen. Maybe grease it before adding the crust?? You shouldn’t have to though because of the butter in the crust. My crust stuck to the pie plate…impossible to get off. Wondering if I should of used parchment paper?